In this article, we will learn to create a page similar to login page with controls like Input, Date Picker, Time Picker, Buttons, etc. using a common PCL project that works for all major platforms including iOS, Android and Windows. First of all, create a cross platform project using Portable Class Library (PCL) which is the common code base for all platforms. Add a XAML page in PCL project. 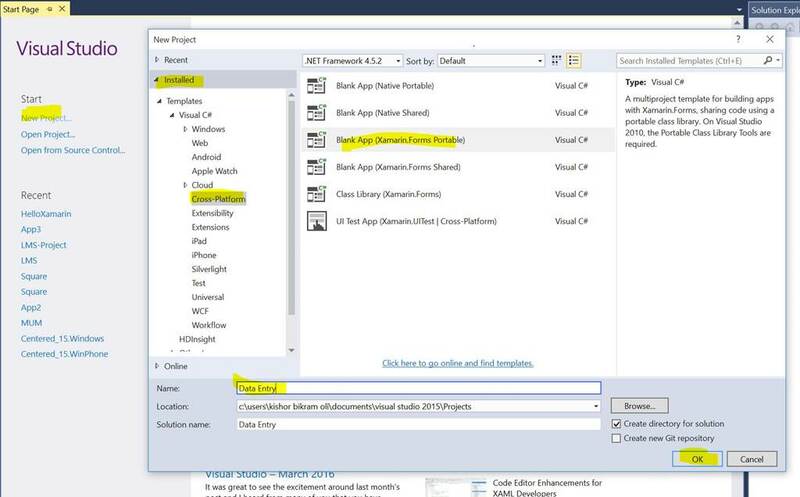 Right click on PCL project > Add > New item > Cross Platform > Forms Xaml Page and Click Add. Next we create a Model class named “Member” class where we set the values from the XAML controls and display the same in a Dialog box. Right Click on PCL Project and Click > Add > Class > Name it Member and Click Add. Here, FirstName, MiddleName, LastName, DateTime are used to set and get the values. And in the Member constructor, we pass all the values as parameters and set the values to the respective ones. Now in the code behind MainPage.xaml.cs, we add click event handlers that we created in XAML page. In the Save button event, we add all the data into a List. And in the View button event, we display the data from the list in a Dialog Box. Run the application in your android or windows devices/emulators. When you save and then view, you will see the following output. Note - Since the whole project has very large size download the Portable Class Library (PCL) only from GitHub.